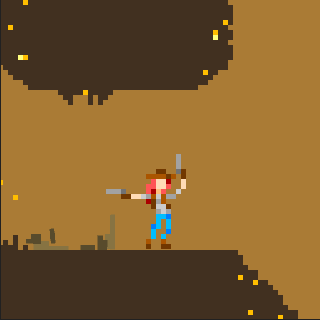 You are a treasure hunter exploring the depths of an abandoned mine. With you are your most loyal companions: a pair of guns with unlimited ammunition and a very powerful recoil. The drawback is you can't move while wielding them. The guns are just an excuse to try a new mechanic. 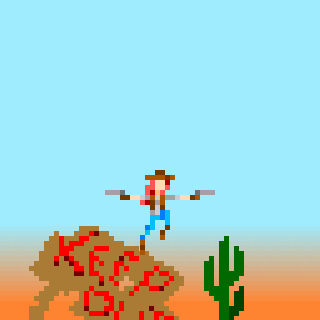 Originally made for the Wild West Jam (hosted in GameJolt) but with the LOWREZ JAM in mind. After that I made the display bigger to allow more freedom and better understanding of the surroundings, I also changed the way the guns shoot. This game is pretty refreshing. One thing I had a problem with was the controls. My right hand tends to cramp a lot during play so I have to take breaks. Could you bind it to the arrow keys? Anyway this game has an awesome concept. Thanks! This kind of comment helps a lot to keep it up! Hey! Got here from TIGSource, but wanted to say...interested in the mechanics! Kinda like the art style too. Like has been said, I just think the mechanics need to be tuned up and tested more, but you could have something really fun on your hands here.